Why are high vaccination rates important? Vaccines create “herd immunity.” If enough people have their shots, diseases can’t spread as easily, and that protects people who can’t be vaccinated themselves—including very young babies, people with vaccine allergies, and those with compromised immune systems. Herd immunity is especially important for measles, which is spread through the air by droplets from an infected person’s nose or mouth. One person can infect 12 to 18 other people in an unvaccinated population, making it one of the most contagious diseases known to science. While the most common symptoms include a high fever, runny nose, and a painful, spotty rash, many patients suffer serious complications. One in 10 children with measles suffers ear infections, while 1 in 20 develops pneumonia. Encephalitis, swelling of the brain that can cause permanent damage, affects 1 in 1,000. Before the measles vaccine was introduced in 1963, it’s estimated that 4 million people in the U.S. were infected every year, with 48,000 hospitalizations and 500 deaths. Vaccines also prevent other childhood diseases, such as mumps, whooping cough, and rubella, all of which can be dangerous. During the 1964–65 rubella epidemic, 11,000 babies exposed to the virus in utero were born deaf, 3,500 were born blind, and 1,800 were developmentally disabled. Why the objection to vaccines? No major religion specifically prohibits vaccination, but some deeply religious people view it as unnatural or interfering with God’s will. The ranks of “anti-vaxxers” also include secular people on both the Right and Left who are deeply suspicious of government, science, and big pharmaceutical corporations. Most parents who reject some or all vaccines, recent research indicates, are white, college-educated, and relatively affluent. Their main concern is vaccine safety. How common are such beliefs? Only 2 percent of kids nationwide go unvaccinated for nonmedical reasons. 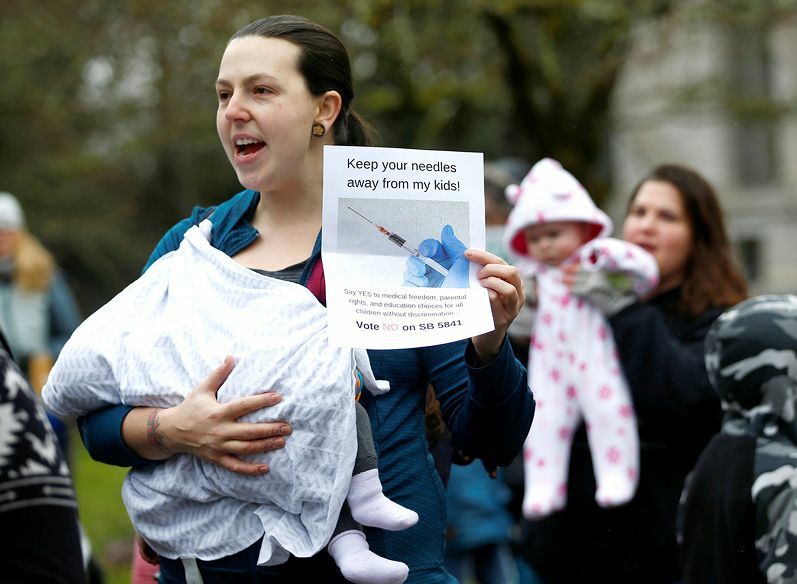 But a much larger number of parents delay or skip some vaccines because of their fears about safety. A 2011 survey of parents with young children found that 1 in 10 used an alternative vaccine schedule to the one recommended by doctors. Some parents falsely believe too many vaccinations can “overload” a child’s immune system, even though kids are exposed to millions of pathogens every day. The World Health Organization has labeled “vaccine hesitancy” one of the top 10 global health threats for 2019. Social media has become one of the main sources of vaccine misinformation. A study in the United Kingdom by the Royal Society for Public Health found that half of all parents with young children in the country were exposed to misleading information about vaccines on social media. A recent investigation in The Guardian found that the top 12 vaccine-related Facebook groups were all anti-vaccination; eight of the top 12 pages returned by Facebook’s search engine contained anti-vaccine propaganda. YouTube’s autofill suggestions and recommended videos also routinely steer users to anti-vaccination content. Researchers also observed Russian bot and troll accounts spreading virulently pro- and anti-vaccination content as part of their effort to sow political discord in the United States during the 2016 presidential election. “The social platforms have a responsibility to start investigating how this content is spreading and the impact these narratives are having on targeted audiences,” says Renée DiResta, who researches online disinformation with the organization Data for Democracy.